As per the rule followed in the steps given above, find out in each of the following questions the appropriate step for the given input. Which elements is fourth to the right of the one which is ninth from the right end in step III of the given input? Which element comes exactly between ’16’ and ‘Salary’ in step IV of the given input? If in step V, ’16’ interchange its position with ‘Orange’ and ‘Hungry’ also interchange its position with ’65’ then which element will be fifth to the right of ’42’? Which of the following combinations represents the first two and the last two elements in step VI of the given input? In which step are the elements ‘Hungry 98 Angry 71’ found in the same order? Answer – 5. The given order of the elements is not found in any step. P sits immediate right of the person who likes USD. R sits one of the extreme ends of the line and likes USD. C sits third to the right of person who likes Euro. P does not face A and faces south direction. The person who likes Rial sits exactly between the persons who like Ringgit and Dinar. The person who likes Pound faces the person who likes Ringgit. T faces North Direction and sits the immediate left of Q. Only one person sits between the persons who like Peso and Rupee. The person who likes Rupee sits to the immediate right of Q. P faces one of the immediate neighbors of the person who likes Euro. D likes neither Dinar nor Pound. D faces one of the immediate neighbors of the person who likes Peso. Only One person sits between the person who likes USD and Q. C sits to the immediate right of the person who faces S. Only two people sit between C and E. One of the immediate neighbors of the person who likes Dinar seated behind the person who likes Peso. A faces the opposite direction to the person who likes Dirham. The one who likes CFA Franc faces the North direction. Who amongst the following faces the person who likes Pound? Which of the following is true regarding C? Answer – 1. C faces south direction. 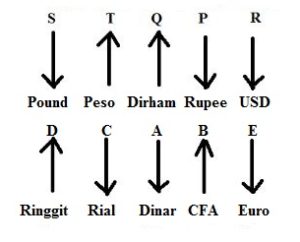 R is related to Rupee in the same way as C is related to Dinar based on the given arrangement, To who amongst the following is T related to the following same pattern? Who amongst the following sit at the extreme end of the row?